Monaco is once again going to be hosting an Indian wedding with 700 guests. The bride and groom are from two very wealthy families of New Delhi, who have chosen Monaco as their preferred wedding venue to say yes. This wedding event is so grand that it will totalise over 3500 nights for the hotels of the Principality, and the head of the tourism office is delighted to have been able to meet the bride and groom in India, in order to prepare the event which will be in the public eye of Monaco. Over the last few years the Director of Tourism has been focusing on making Monaco an attractive venue for grand family events with a particular focus on Indian families. This being said, the bride and groom to be were delighted with the idea, as it will be cheaper to host the wedding in Monaco, as would they have had the wedding in their homes, the guest list would have been close to 5000 people. Who would have thought? For the happy select 700, the Monaco lifestyle is reserved for them over the course of the week. The guests (who for the most part all live in London), will all be staying at the best hotels Monaco can offer, will be going from party to party, building up to the biggest and best being held in the Espace Ravel at the Grimaldi Forum (4000m²) for the pre-wedding dinner. All the tents and draping were made in India and shipped to Monaco for the event. According to certain sources, the wedding envelope of 2 million Euros will be spent in the Principality. 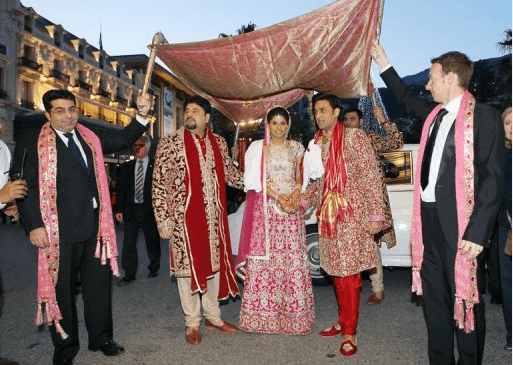 Already in 2011, an Indian couple got married in Monaco a few days before the Prince’s wedding. 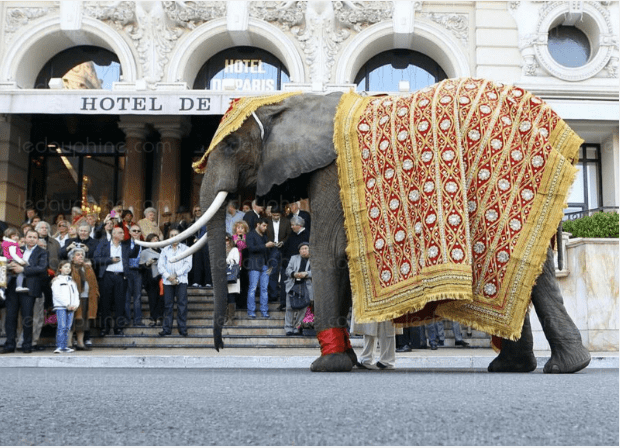 The wedding party included the presence of elephants, which was quite a site in the streets of Monaco. This time around, no elephants and no horses, as there is strict security protocol. Monaco will be adorning Indian colours over the next few days.